We put our long term experience on paper, CAD programs and in action by designing any custom work you may need, always following the latest standards, the most cost-effective process as well as the right selection of materials. The result is always according to your needs and desires and we only intervene when our expertise can advise you in a better outcome. We look forward to guide and assist you into the design of your next successful project. Need design services from people you can trust? You are in the right place. Send us your inquiry and we will be glad to help you. Our design process starts with research and a lot of it. We go through every detail and get all the feedback is needed from the market and our design experts. We can then safely proceed to putting your project into paper and CAD programs. 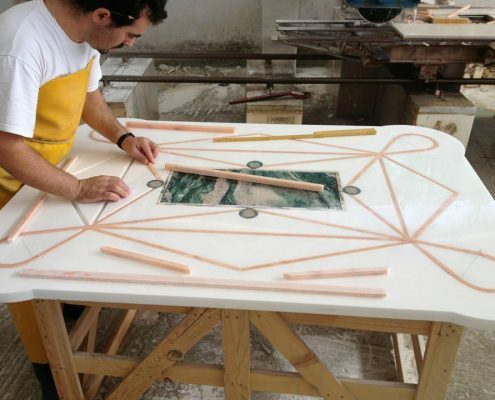 Your design begins to take shape while we carefully take care of every detail for your installation. The final design is handed over to you for your comments and approval. After everything is taken care off, we immediately begin the production process. Each design is made fresh and is completely personalized to your needs. This way you know that your project is going to be a “one of a kind”, giving your home or office a personal and unique touch of yourself. In any case you need inspiration you can of course take some ideas from the various designs we have made throughout the years and then transform it into a tailor-made version just for you.